And yes, I'm kind of copying Amanda Jean. What should I do with the leftover rectangle? Cut it into some hearts and raw edge applique it on some hand towels for valentine's day home decor? I like what you've one with the scraps. Use it in the backing of your little quilt. Use it on the backing of the quilt. Great idea! How about a cushion or bag with the leftover? I like Jennifer's idea I think that would be very cute. I also thought about using it on the backing, but there is a nice size piece there and you could cover a notebook and make it into a sewing journal. have you ever seen a tossed 9 patch--saw it done on quilt in a day. 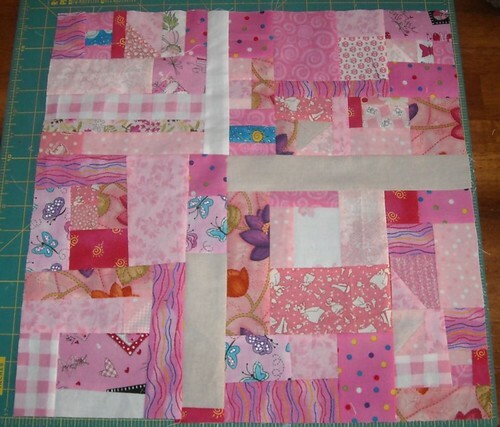 you make nine patch blocks, then cut them through the middle into four pieces--any size 9 patch works. then sew back together all mixed up--http://www.carriagequiltshoppe.com/Tossed9Patch.JPGshe had a light color in the middle. What are you doing with the big square? You could sew them together and make a cute placemat! 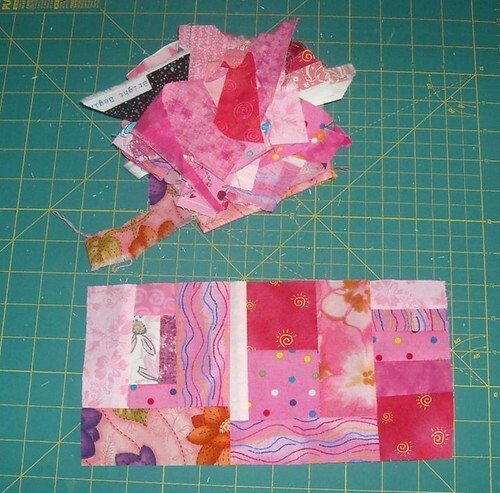 or make more blocks for an awesome quilt! Send it to me! Hee hee! Just kidding. I think it would be adorable on the back of the quilt. I LOVE when the back is just as interesting as the front of a quilt! Came here via Sew, Mama Sew!